It was the last day of our trip, and we had a carefully selected agenda of “Places That are Open on Mondays.” To be fair, these were places we actually wanted to go, we just timed them so we could visit the not-open-on-Mondays places on other days. First up, Vyšehrad, the OTHER major castle in Prague, and home to a number of famous Czechs’ burial sites, as well as another random diacritical mark. Sadly, we don’t appear to have taken any good pictures of the OUTSIDE of the castle, since it’s rather far from downtown, so here’s the Wikipedia link for reference. Oh. How’s that fear of dark enclosed spaces working out for you there? [Note from Leigh: This was the lit portion of the walk. The rest was pretty much pitch dark.] Seriously, you couldn’t see the floor, and the walk was about a quarter of the mile from the gate to the gallery and back. It was at least nice and cool. The walk did turn out to be worth it, however – the gallery at the end of the walk contains the originals of some of the sculptures from the Charles Bridge. (Did we mention that the ones out there now are almost entirely copies?) This was a quite impressive and imposing way to view them. Just try not to think about “Blink” while you’re in here. These casements apparently used to hold ammunition and supplies for whoever was currently in control of the castle complex. After this, we went to a modern art museum on the north of town, where they didn’t allow photography, so no pictures. It wasn’t really all that exciting a collection anyway, although there was a David Czerny on the roof. We decided to finish the day by using our transit pass to find a few more far-flung geocaches, and then headed back to Wenceslas square for a final walk though Old Town. Since we had a very early flight the next morning, we had decided to eschew a hotel room, and just spend the night in the airport. We’ve done this before, in Helsinki, and it wasn’t much fun then either. We discovered that if you attempt to lie down in the Prague airport, the cleaning lady will start screaming at you in Czech. At least, we assume it was Czech. But it was definitely screaming. With our last two full days in Prague, we had a number of remaining sights we wanted to visit. Prague was home to the two most famous Czech composers, Dvořák and Smetana. We had already wandered into the Smetana museum on our first evening, so today it was Dvořák’s turn. Incidentally, in order to get the diacriticals right, I’m having to cut and paste the name “Dvořák” each and every time it appears in this post. I hope you appreciate how much work we put into this blog that we haven’t finished writing nearly two months after the fact. Um. Hey look! A dog wearing a hat! That’s right – Pavlov got a metro stop named after him, and a picture of a dog to boot. We got off the metro at the Pavlov station, because the bell rang and we felt strangely compelled to. Also, it’s where Dvořák’s house is. Well, not at the station … just nearby. Dvořák’s house is a quaint little abode with lots of memorabilia and recordings to listen to. There was a lot of nice information on the composer, and a whole set of displays about how obsessed he was with trains. (Hint: very.) Dvořák would apparently send letters to people whose sole contents were a detailed description of the list of trains that could be expected to carry the letter to the recipient and deliver the reply. While he was a brilliant composer, I get the impression he’s not someone you’d actually want to spend a lot of time talking to, if you get my drift. Seriously – it’s big. But it’s not the most remarkable thing about the monument. No, that would be the dead guy. Klement Gottwald was the first communist president of Czechoslovakia, and was Not A Nice Man. When he died, party leaders decided that anything creepy and cult-of-personality-esque that the Soviet Union could do, they could do just as well. So they mummified him. Still visible at the memorial are the room where his body was placed on view for many years, and the control room. I’m not sure, but I think the phone was a hotline so that Zombie Gottwald could receive orders from Zombie Lenin. And it turns out that all this equipment was for naught anyway, because the mummification process was screwed up and he started to rot, so they had him cremated in the end. This stuff included finally getting around to riding the funicular railroad up to the top of Petřín Hill. (More diacritically-based cutting and pasting there.) There was an observation tower which had a spectacular view of the city, and also a great vantage point of one of the most amazing architectural white elephants in the world. You’re looking at Velký strahovský stadion, or the Great Strahov Stadium. In case it is not clear from this photo, it is gi-friggin-normous. The field is as large as nine regulation soccer pitches. It seats a quarter of a million people. Surprisingly, it is not a communist relic, but dates from the 1920s. It was originally intended to host mass exercise demonstrations. That’s right. 250,000 people came and watched other people exercise. Here’s a clip from one such demonstration in the 1980s. Including swan dives. Because swan dives. No one can figure out what the hell to do with the stadium today. Even the Rolling Stones couldn’t get it more than half full. We continued the evening with a nice trip through a mirror maze (as one does). This one was left over from an exhibition in the 1890s. In our post on the second day of the trip, we mentioned running across some creepy baby sculptures in a park in Prague. And by “creepy,” we mean “baby sculptures the size of a Honda Element with slot machines for faces.” These sculptures are by a Czech artist named David Černý. Leigh had come across some discussion of Černý while she was doing research for the trip, and once she saw (and fell in love with) the creepy baby sculptures, it became a running theme of our visit that we tried to find as many of his sculptures as we could during our time in the city. Rather than scatter them across the posts in chronological order, here they are all in one place, for maximum effect. Černý is a sort of an enfant terrible of Czech art. Most of his pieces offer a wry commentary on politics, society, or both. Luckily the citizens of Prague seem to appreciate and enjoy that sort of thing, because Černý’s pieces are displayed publicly throughout the city. Thanks to Uncle Internet, we managed to find quite a few of them. It’s hard to tell from the photo, but this is Sigmund Freud. 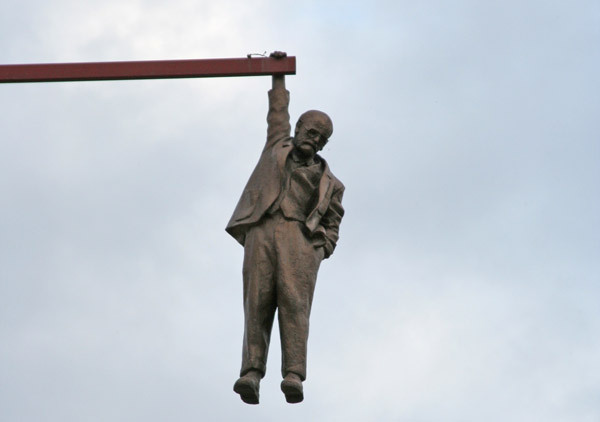 Well, It’s a statue of Sigmund Freud hanging by one hand forty feet above the streets of Prague. Because of course it is. The sculpture is actually hinged so it waves back and forth in the wind. Many pedestrians walk right under it without noticing it. Here’s a closer view of Siggy, just hanging out with one hand in his pocket. The base of this fountain is shaped like the Czech Republic, and the two gentlemen are motorized such that their hips and, erm, appendages swivel and move up and down. They’re controlled by microprocessors so that over time, the streams of water they are emitting spell out quotes from Czech politicians in the pool. As we said, Černý is not given to subtle political statements. You used to be able to text messages to the sculpture and they would spell that, but that feature seems to be disabled. Oh, and the whole assemblage is in the courtyard of the Franz Kafka museum, because of course it is. Yeah, so… this is a pixelated naked woman. The, erm, undercarriage is hollow, so you can climb up inside, and then emerge. There used to be a sound and light show inside the sculpture that contained red lights and vague watery whooshing sounds. This one was right near our hotel, so we walked past it three or four times a day. Located just steps from the terrifyingly improbable elevator described in our last post, and within a luxurious retail plaza’s atrium, this is a parody of the statue of St. Vitus on Wenceslaus Square nearby. Given that the one on the square is an important national symbol, this is about as unsubtle a skewering of the Czech polity as one could imagine. This is located in the garden of the German Embassy, which does not allow visitors to come in and wander around at random, so the picture is a bit farther away than ideal. It’s a Trabant. On legs. 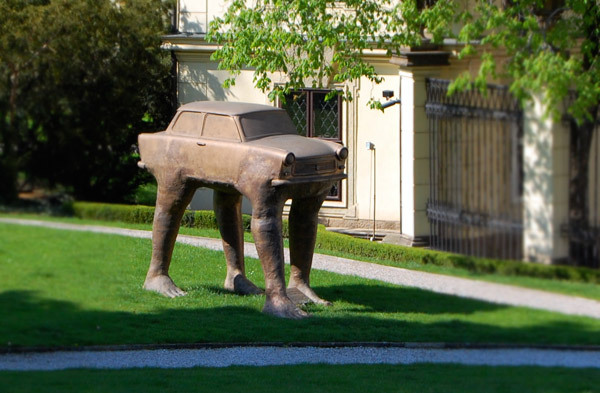 Here’s a link to a closer picture so you can see that yep, it’s a Trabant with legs. In the summer of 1989, hundreds if not thousands of East Germans came to Prague and occupied the then-West German embassy in hopes of being able to leave East Germany and move to the West. Many of them abandoned their Trabants on the street when they were finally granted passage to the West. This is Černý’s response. And finally – remember those creepy babies? Yep. Babies. Creepy ones. Crawling up the Zizkov TV tower, which is the highest tower in the Czech Republic. You can see the creepy babies from pretty much everywhere in town. Apparently Černý was asked to do an installation on the tower, and this is what he proposed — and people not only approved it, but liked it so much that it became permanent. In other words, awesome. We actually ran across one more of his later on, but we didn’t realize it was his, so we didn’t take a picture. It’s a giant skull on top of the modern art museum.